An analysis by market research firm Kantar Media estimates that pharma spent $4.5 billion on prescription drug advertising in 2014, which is up almost $2 billion from 2000. With so much emphasis and money being spent on these advertisements, HCPs need to learn how to critically evaluate these communications in order to help their patients when they have questions about “the little blue pill on TV”. Contrary to popular belief, direct to consumer advertising was never legalized in the United States. It has always been legal and, unlike other countries, it has not been outlawed. With that in mind, there are rules all companies wishing to advertise their products to consumers and HCPs must follow. The regulations can be found in Part 201 of the Code of Federal Regulations. There are pages and pages of regulations that work to ensure that prescription drug advertising is truthful and non-misleading. The FDA’s Office of Prescription Drug Promotion (OPDP) is the governing body that enforces these regulations. It is important to note that the FDA is only responsible for the promotional activities of prescription drugs and the Federal Trade Commission (FTC) is responsible for over-the-counter (OTC) product promotion. Critically evaluating a drug advertisement is easier than you might think. One quick way to evaluate an advertisement is to look for fair balance. All advertisements are required to have a fair balance between efficacy information and risk information. This applies to both the amount of information presented and the way in which it is presented. Most advertisements will contain multiple efficacy claims about a product and, at a minimum, the same advertisement should contain any black box warnings, contraindications, warnings and precautions, and a summary of the most common or serious adverse events. In print advertisements, the risk information must be presented with the same prominence as the efficacy information (i.e., same font, color, and size). In the case of television advertisements, the risk information is usually presented at the end of the advertisement and can be somewhat abbreviated as long as there is a directive to find further information (i.e., website or print ad). This is only a small part of the regulations that must be followed by the drug sponsors when advertising their products. Some other categories of violations are minimization and/or omission of risk information and overstatement of efficacy. 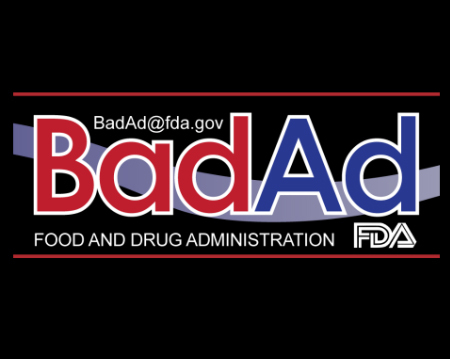 If you think you have seen an advertisement or speaker program that violates these requirements you are encouraged to report it to the FDA’s BadAd program. Click here for more information about the BadAd program including an online CME/CE course.